Scientists at Rutgers University–New Brunswick and elsewhere are at a crossroads in their 50-year quest to go beyond the Standard Model in physics. Rutgers Today asked professors Sunil Somalwar and Scott Thomas in the Department of Physics and Astronomy at the School of Arts and Sciences to discuss mysteries of the universe. Somalwar's research focuses on experimental elementary particle physics, or high energy physics, which involves smashing particles together at large particle accelerators such as the one at CERN in Switzerland. Thomas's research focuses on theoretical particle physics. The duo, who collaborate on experiments, and other Rutgers physicists – including Yuri Gershtein – contributed to the historic 2012 discovery of the Higgs boson, a subatomic particle responsible for the structure of all matter and a key component of the Standard Model. Rutgers Today: What is the Standard Model? Thomas: It is a theory started about 50 years ago. It should be called "the most fantastically successful theory of everything ever" because it's a triumph of human intellect. It explains, in a theoretical structure and in great quantitative detail, every single experiment ever done in the laboratory. And no experiment so far conflicts with this theory. The capstone to the Standard Model experimentally was the discovery of the Higgs boson. It predicted the existence and interactions of lots of different particles, all of which were found. The problem is that as theorists, we are victims of our own success. The Standard Model is so successful that the theory does not point to answers to some of the questions we still have. The Higgs boson answered many questions, but we don't get clues directly from this theoretical structure how the remaining questions might be answered, so we're at a crossroads in this 50-year quest. We need some hints from experiments and then, hopefully, the hints will be enough to tell us the next theoretical structure that underlies the Standard Model. Rutgers Today: What questions remain? Somalwar: The Standard Model says that matter and antimatter should be nearly equal. But after the Big Bang about 13.8 billion years ago, matter amounted to one part in 10 billion and antimatter dropped to virtually zero. A big mystery is what happened to all the antimatter. And why are neutrinos (also subatomic particles) so light? Is the Higgs boson particle by itself or is there a Higgs zoo? There are good reasons that the Higgs boson could not possibly be alone. There's got to be more to the picture. Rutgers Today: What are you focusing on? Somalwar: I am looking for evidence of heavy particles that might have existed a picosecond after the Big Bang. These particles don't exist anymore because they degenerate. They're very unstable. They could explain why neutrinos are so light and why virtually all antimatter disappeared but not all matter disappeared. What we do is called frontier science – it's at the forefront of physics: the smallest distances and highest energies. Once you get to the frontier, you occupy much of the area and start prospecting. But at some point, things are mined out and you need a new frontier. We've just begun prospecting here. We don't have enough mined areas and we may have some gems lying there and more will come in the next year or two. So, it's a very exciting time right now because it's like we've gotten to the gold rush. Thomas: I am trying to understand the physics underlying the Higgs sector of the Standard Model theory, which must include at least one particle – the Higgs boson. This sector is very important because it determines the size of atoms and the mass of elementary particles. The physics underlying the Higgs sector is a roadblock to understanding physics at a more fundamental scale. Are there other species of Higgs particles? What are their interactions and what properties do they have? That would start to give us clues and then maybe we could reconstruct a theory of what underlies the Standard Model. The real motivation is to understand the way the universe works at its most fundamental level. That's what drives us all. Physicists, and especially, anyone who is smart, will never find out anything true if they serve the basis of the emergence of BB. Big Bang has so much entangled the science that people who deal with these problems know nothing about themselves and their existence. These nebulosities, such as the phenomenon of BB, the spread of the universe, the dark matter and matter and energy, the Higgs boson, the gavitation waves and the perplexing Einstein theory and the story of a "marital bond" spat out space, where time orders the space to twist, and the space of time will be shortened and similar nonsense, these are "pesticides" for consciousness. Every reasonable one needs to see that those experts are contaminated and they do not know anything about: the structure of the universe, how and from what the matter arises, what is gravity and magnetism. For the sake of these ignorance, they invent some antimatter, dark matter, and matter and energy, offer us the formation of a universe from nothing, and this is shown as a time of beer. All people should undergo a profound psychiatric examination and be banned from not deceiving young people and young generations and not deter them from those who have formed all this, even our human beings.
" 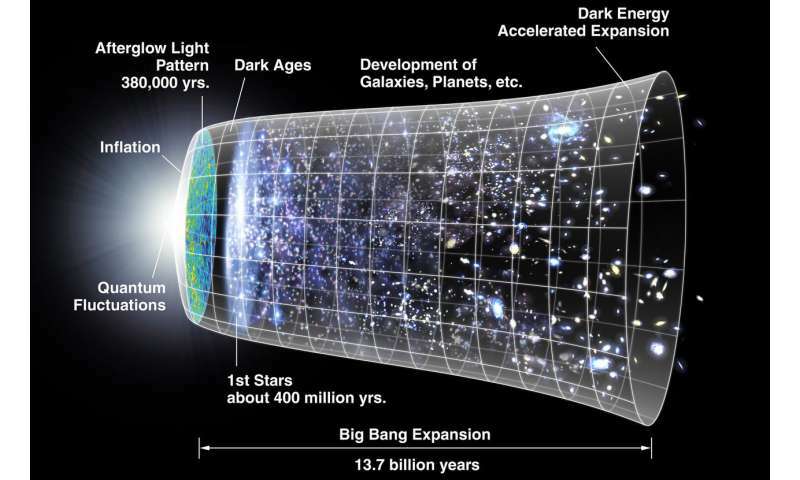 after the Big Bang about 13.8 billion years ago, matter amounted to one part in 10 billion and antimatter dropped to virtually zero. A big mystery is what happened to all the antimatter." Why would anything happen to it? Why aren't there antimatter galaxies out there - 50%, or pretty close to it? The usual reason given is that we would see more annihilation radiation if there were. But the annihilation energy mostly went into fueling inflation, it would seem. They're angry. End of the story. They forgot to mention quantum gravity as one of the big questions that remain open; in fact, it may be the biggest of them. cience attempts to harmonize the properties and the formation of gravity with some imaginary developments in quantum mechanics, but they do not know what gravity is and how it arises, and what is quantum and who causes it and what size it is, it is again their problem that does not solve many phenomena in the universe. Actually it gave me the opportunity to add one to my list who was new to me, tallenglish. Always glad for those. "Somalwar: The Standard Model says that matter and antimatter should be nearly equal." In which case newly formed particles would have a 50-50 chance of survival. That is, they gravitate or otherwise encounter a similar matter type particle. In which case it could be possible in some universe that all 10^80 particles all clump together in one humongous black hole. Certainly more likely would be a black hole of 10^40 particles. Since the total number of particles are about 10^80, there would be in this universe 10*40 opportunities for a black hole of magnitude 10^40 to form. Since the probability of formation of a black hole of 10^40 similar type particles is 1/10^40, the possibility of formation of one of these black holes in 10^40 tries is, yes, likely. So we shouldn't be surprised to find some of those big boys out there. In fact there would have to be many more particle pairs than 10^80 initially formed because many of them would be annihilated. The 10^80 number is only the surviving number of particles of each type. Here's one to cheer us up: Galaxies, it appears, are only temporary states of matter falling into their black holes. And eventually after numerous black hole annihilation events there will be only two left standing, and when they annihilate it's deja vu all over again. Cheers. Who is so clever and powerful that he could calculate that in the universe there are 10 ^ 80 particles. ? But, where is the problem that disavows this? The first is that this smartman does not know what the universe is and how much, Secondly, he does not distinguish neither the type nor the way of forming the particles, which is the biggest flaw, no one knows what the antimatter is. To know this, it would have been discovered to date, but I say that there is no antimatter in the universe as something permanent. In matter, the "anti" means the opposite of spin. Who is so clever and powerful that he could calculate that in the universe there are 10 ^ 80 particles. ? Scale it down to whatever you wish. These types of arguments aren't actually scientific because they aren't testable. Only the mathematics itself, so it turns out to be only an exercise in mathematics. And mathematics is one type of tool that many people use to make something new or discover something. If non-humans use this tool, I can get rid of it, mostly, mind. If non-humans use this tool, I can get rid of it, mostly, mind. Did you start looking for your own consciousness in the computer? There is infinitely many intelligence and it is an artificial (it can be bought). The sentence structure used in your questions seems to be good. Otherwise you might want to invest in some of this intelligence. No. I do not want to participate in the funding of artificial intelligence, because with this intelligence, science is sufficiently blinded. The Sloan Digital Sky Survey does come to mind. Do scientists know what intelligence is and what does it explain? So science does not know anything about what gravity is, how it arises and what its purpose is in the universe, and there are hundreds of "evidence that gravity works, just what is the problem, not one" proof "is the same. Soon science will make a model for computers to work children. How smart are some, and this will try !! Do scientists know what intelligence is and what does it explain? Definitely not always smart enough to know what cornball philosophy is, don't you think?